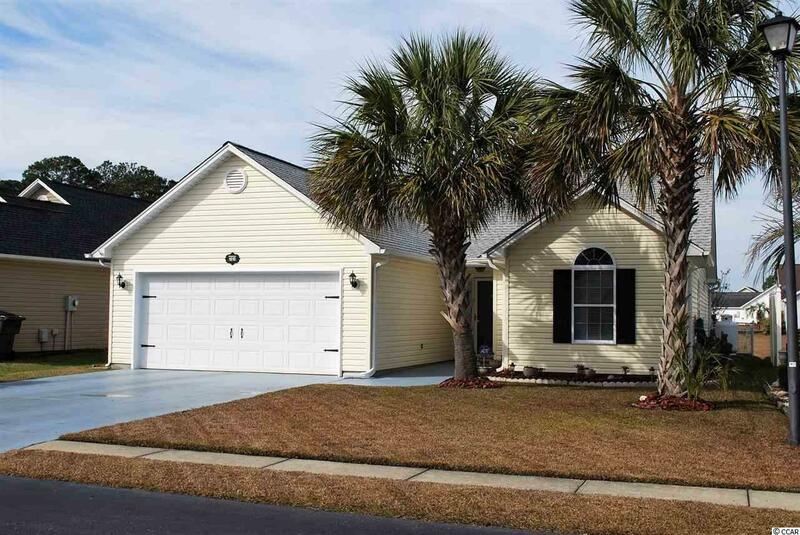 Just about one mile to the beach and close to amenities and Myrtle Beach International Airport! Easy golf cart ride, bicycle or walk to the beach. This spotless well cared for 3 bedroom 2 bath non-smoker home has an open floor plan on one level and sits on a beautiful bulkheaded pond. Cathedral ceilings and lots of windows let in natural light. All windows have either custom blinds or cordless cellular blinds. Custom woodwork trim throughout. The Kitchen has been updated with premium cherry hardwood cabinets. The large living room has a dining room area at one end. The master bedroom has a walk in closet. The master bath has a Garden Tub with shower and double bowl sink vanity. The kitchen has an eating area at one end with a swing wall mount for TV to watch the morning news while having your coffee and looking out at the pond. At the other end, there is an enclosed laundry and a double wide pantry and a custom built in bookcase with wine rack. The Carolina Room is plumbed with a propane line for a fireplace and has 6 large windows for viewing your fountain and the pond off your backyard. There is lots of wildlife including ducks, geese, swans, turtles, fish and a few rabbits. The backyard is fully fenced with two gates. Enjoy the outdoors on the enlarged concrete patio with a cantilevered picnic table, umbrella and two removable sun shades. All appliances including range, dishwasher, refrigerator freezer, microwave and front load washer and dryer convey. All floors have been updated by the present owner. The 2-car garage has a corner workshop area also with lots of cherry hardwood cabinets, pegboard for your tools and lots of lighting. On one garage wall, there is a wall mounted fishing rod holder. Outside the garage door is an outdoor shower to rinse off sand after a day at the beach. If you need room for storage, there is fully floored space over the garage and a second area in the attic of the home. Front yard sprinkler system. Four wall mounts for TV’s in home and one in garage This home received a new roof 2017 with top of the line materials and has a transferable GAF Lifetime Ltd. Warranty Upgrade to the new homeowner. Protected with Termidor and maintained against Termites and has a transferable repair warranty. Trash pick-up weekly and a private mailbox at end of your driveway. Great pet friendly neighborhood to walk sidewalked streets.